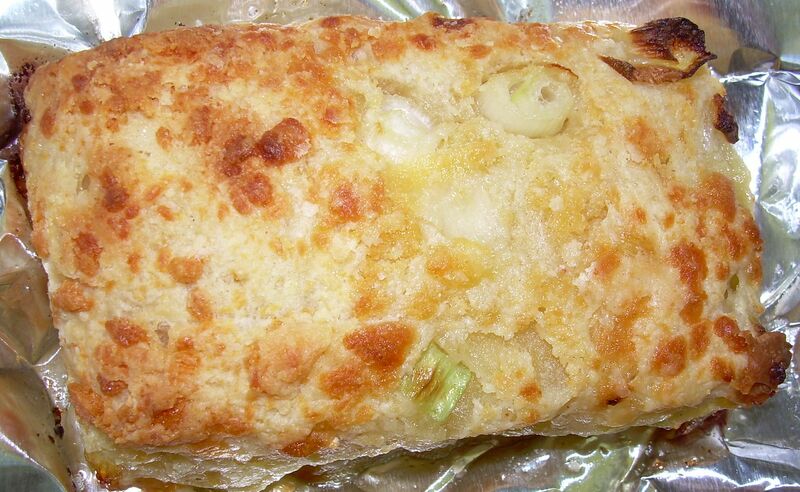 TWD – “Really Exceptional” Apple-Cheddar Scones. Come on in and set a spell. I have some stories to share. Have a bit of tea and a “really exceptional” scone, to quote my husband. I’ll get to these luscious, cheesy scones in just a bit. 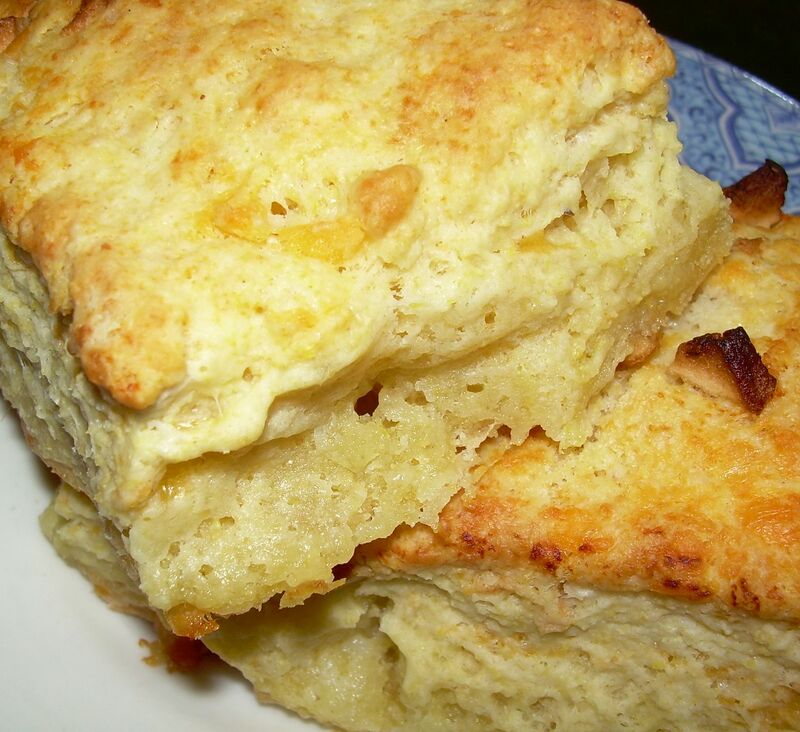 Continue reading after the jump . . . .
continue reading "TWD – “Really Exceptional” Apple-Cheddar Scones." No Tuesdays with Dorie for me this week, as I’m on vacation (I’ll be back tomorrow.) But I did whip up something else before I left . . . I bake a fair amount of scones and biscuits for a variety of reasons: they’re quick, easy, affordable, and a great way to Clean Out the Pantry. So, recently when I found myself with some scallions and cheddar that needed to be used up, and little time for baking, I turned to The King Arthur Flour Baker’s Companion: The All-Purpose Baking Cookbook for some inspiration, and found it in the recipe for Scallion Cheddar Scones. These were a big hit at Chez Chow. I have no idea why, but they smelled like bacon when I was baking them. And whether you eat bacon or not, you have to admit that nothing else smells quite like it does. Will I be making these again? In a heart beat. I’ve hidden some scallions and cheddar in the back of the fridge expressly for that purpose! 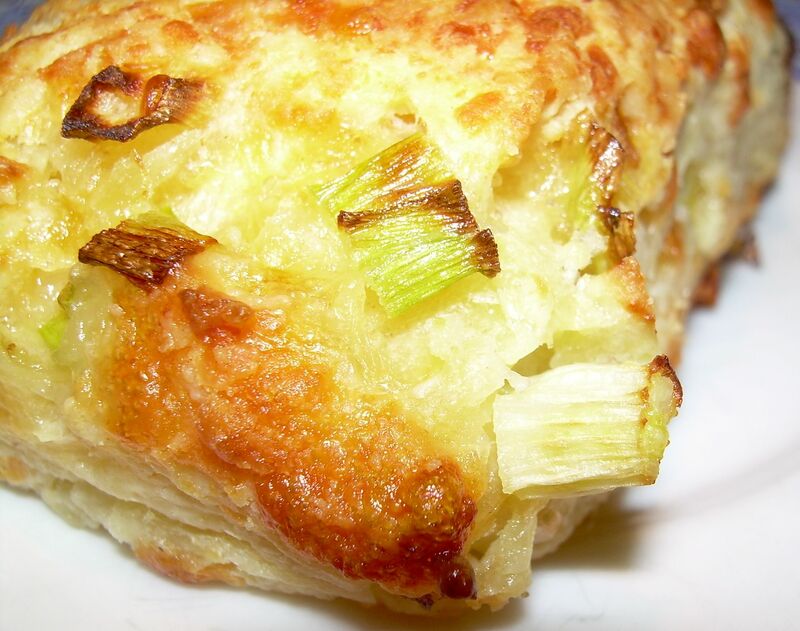 continue reading "Luscious Cheese Scallion Scones"
Sorry the photo above isn’t too good – the others mysteriously disappeared from my hard drive. After shelling out $600 last year to “repair” our desktop, we are coming to terms with the sad reality that we are going to have to replace it. The good news? We are going Mac! 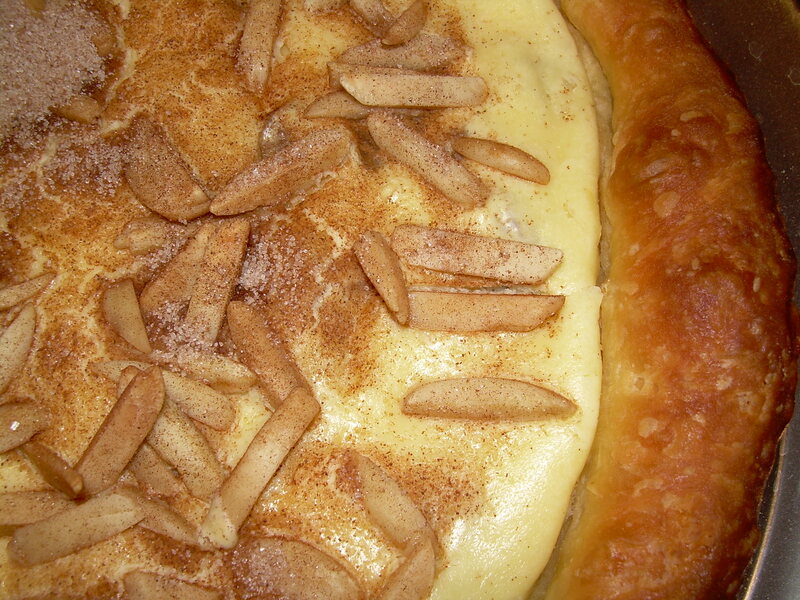 Now, about the strudel. Pulling my own strudel dough has mesmerized me for years, the way making macarons has affected other bloggers. I read a ton of cookbooks, and even watched videos on You Tube (this one is humorous and instructive). The night before I made the dough, I dreamed all night that I was making strudel. I practically worked myself into a tizzy. Finally, I turned to Carole Walter’s fabulous book, Great Coffee Cakes, Sticky Buns, Muffins & More: 200 Anytime Treats and Special Sweets for Morning to Midnight. Note the filling explosion on the bottom, left. 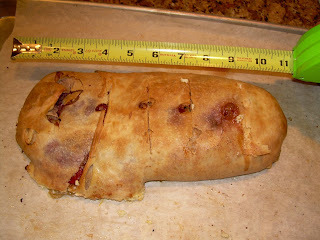 This little strudel endeavor triggered the loss of my baking mojo, much to my dismay. I tore the dough repeatedly, and finally decided to stop while I had something left in which to roll up the tasty filling. 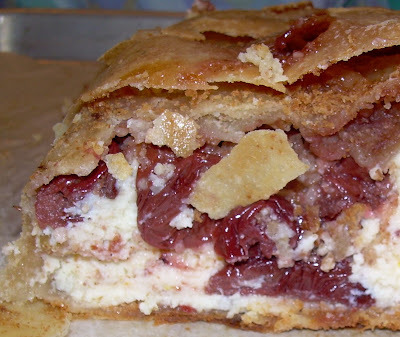 And tasty it was, folks: a cherry cheese filling from Ms. Walter’s book, a filling that I made using sour cherries that I had pitted and frozen last year. I was eating the stuff with a spoon, and had to restrain myself. Luckily, the horizontally challenged strudel was too short to accommodate all the cheese filling, so I was able to eat that for breakfast the next day. What’s a few thousand calories among bakers? Needless to say, I’m going to tackle this again, but with a different dough recipe the next time. If any of you are interested in making your own dough, here are some books that have recipes and instructions: A Baker’s Tour: Nick Malgieri’s Favorite Baking Recipes from Around the World; A Baker’s Odyssey, includes DVD: Celebrating Time-Honored Recipes from America’s Rich Immigrant Heritage; A Treasury of Jewish Holiday Baking; Kaffeehaus: Exquisite Desserts from the Classic Cafés of Vienna, Budapest, and Prague; Indulge: 100 Perfect Desserts; and Desserts by the Yard: From Brooklyn to Beverly Hills: Recipes from the Sweetest Life Ever. Inspired, yet again, by Ina Garten, I decided to try her goat cheese tart. Now, you may wonder at my use of a commercial crust. I make no apologies – they are my yearly Thanksgiving backup, ever since the Jehovah’s Witness Incident of 2004. What, you ask, was that? Ah, yes. I remember it well. I was furiously baking pies on Thanksgiving day. And it was one of those times when nothing was working quite like I had planned. I had just rolled some pastry into one of the pie pans, when a group of very nice Jehovah’s Witnesses rang my doorbell. I was covered in flour, and my hands were filthy. I set the rolling pin on top of the Pyrex pie plate so that I could wash my hands, and the entire pie plate shattered. Glass everywhere. Pastry ruined. Well, ever since then, I make sure to buy a couple commercial pie crusts, just in case. Of course, that means if things go well, I have to use up those crusts, which I did here. Quite tasty, I must say. Even though I prepared the shallots, I forgot to add them to the tart. So I had them on the side. I think the shallots are important, so I would suggest not leaving them out. I also took the liberty of adding some thyme. Heat the tablespoon of butter in a small pan and saute the shallots over low heat for 5 minutes, or until tender. Place the goat cheese in the bowl of the food processor and process until crumbly. Add the cream, eggs, basil, thyme, 1/4 teaspoon salt, and the pepper and process until blended. The tart puffs up beautifully, and yields six generous slices. The perfect accompaniment is a green salad with a light vinaigrette. This ebelskiver did not survive long after this photo was taken. I received and ebelskiver pan for Christmas, much to my delight! Williams-Sonoma had a luscious-looking recipe in its latest catalog, so I dusted off the pan and put it to the test. Surprisingly, these little briquets still tasted delicious, a testament to the rich batter! Some thoughts: Ebelskivers are tricky to make, but boy-oh-boy are they tasty. Flipping them over, without making a mess, is not easy and, even on medium heat (as instructed), they overbrowned. For some reason (the excitement of trying a new recipe?? ), I was so distracted that I forgot to add the beaten egg whites to the batter until I made my second batch. Not much of a taste difference, but the egg whites do lighten the batter considerably, and allow the center to cook through.If you use a jam filling, use a good one. I chose Bonne Maman cherry preserves. I also added extra lemon zest to my batter. The entire cooking process is kind of messy and fast-paced . . . but did I mention these little gems are really tasty? Oh, yes, I see that I did. They’re worth the effort, and I think worth the practice to get them right! Confectioners sugar for dustingWhisk together the flour, baking soda, baking powder, granulated sugar, salt, and lemon zest. Set aside. In another bowl, lightly whisk the egg yolks. Whisk in the buttermilk and ricotta. Whisk the yolk mixture into the flour mixture until well combined; the mixture will be lumpy. Set aside. In another bowl, whisk the egg whites until stiff peaks form. Using a rubber spatula, gently stir the whites into the batter in two additions. Put 1/2 tsp. butter in each well of a filled-pancake pan. Place over medium heat and heat until the butter begins to bubble. Pour 1 Tbs. batter into each well, place 1/2 teaspoon jam in the center of the batter, and top with another 1 Tbs. of batter. Do NOT use more batter. Cook until the bottoms are golden brown and crispy, 3 to 5 minutes. Using 2 wooden skewers, turn the pancakes over and cook until golden brown and crispy, about 3 minutes more. Transfer to a plate. Repeat with the remaining batter and jam. 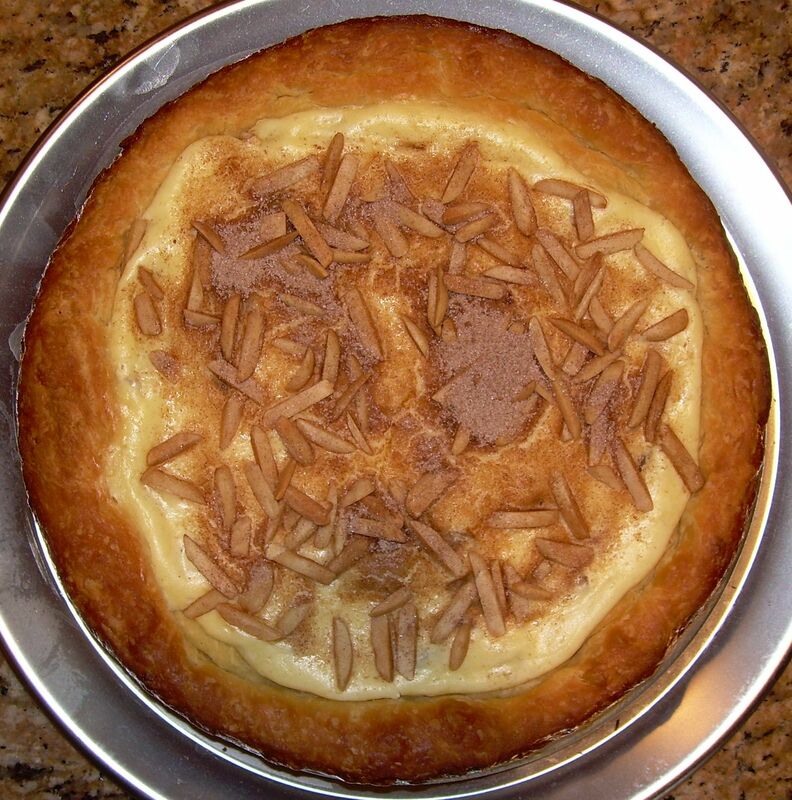 Dust the pancakes with confectioners sugar and serve warm. Makes about 30.